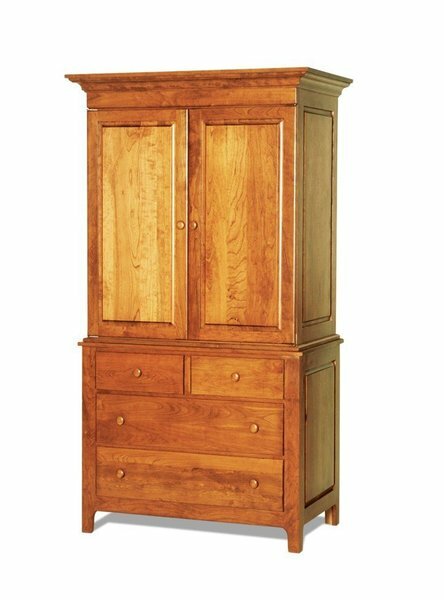 This American made Shaker Armoire can be used as a wardrobe or as an entertainment center. Please call with questions on our Amish Shaker furniture. The traditional Shaker design of this Armoire will provide plenty of extra storage space. This beautifully crafted Shaker Armoire is a one of a kind heirloom item. This wardrobe or entertainment center is handcrafted of 100% red oak wood or cherry wood using quality Amish Furniture craftsmanship techniques. The sleek and sturdy construction, raised panel sides, wooden Shaker hardware and drawers show off the beautiful hardwood grain. The drawers are dovetailed for years of everyday use. The armoire measures an impressive 80" high and comes with your choice of a hanging rod and or adjustable shelves. This furniture can be customized.